October's Independent Manchester Beer Convention, or IndyManBeerCon for short, came and went in a blur. Now in its fourth year the beer festival has really hit its stride, setting the standard for all modern beer events that follow in its footsteps. For me the combination of great beer and food, environment, location, atmosphere and the overall sense of place made it one of the most enjoyable weekends I've had this year. The thing that strikes me most about Manchester is how fiercely independent it is. As a city it's constantly trying to define and redefine itself in order to represent the best it has to offer. You only have to look at the recently redesigned Common bar in the Northern Quarter to see this in real time. As a beer festival, IndyMan is attempting to do the same - to be the very best at what it does while all the time remaining intrinsically Mancunian. The reason Manchester and events like IndyMan have this relentless Northern spirit is because of its people. At the festivals trade session I tried to interview and photograph as many attendees as possible. Not all of them were from Manchester but there is no doubting each and every one of them represents why IndyManBeerCon works as well as it does. These are the Independent Manchester Beer People and this is what they thought of the 2015 Independent Manchester Beer Convention. "IndyMan is just the best, most cutting-edge beer festival. It kind of sums up where everything is at the moment in terms of the beer scene in the UK. It’s a focal point for everyone in the scene and it reaches out to lots and lots of different sections of society. It has a different vibe to a lot of other beer festivals: it’s inclusive, it feels nice and I think that kind of reaching out is something the beer scene needs to do a lot more." "This is our fourth year at IndyMan. The first year we arrived with our first ever keg of beer and here we are four years later with a few more! I think the festival was amazing in year one and gradually the demographic has spread a little bit. It’s the most unique building to host a beer festival in the UK and that’s a pretty special thing in itself and to now be in its fourth year it all feels slightly more polished. Essentially it's people who are really enthusiastic about trying a lot of great beer all in a swimming pool together and that’s a pretty cool and unique thing." "I’m from Manchester so I’ve real pride in having a festival like this in my home city that attracts so many people. The venue’s great, the real splendor of the Victoria Baths brings that history to life but really it’s the bonhomie that makes it. It’s a good natured festival, people just chat to one another, people you don’t know you’ll meet for the first time and share a beer with them. And the beer, it’s such a great range and the combination of all these makes IndyMan so special." "I think what’s great about Manchester is that it kind of feels how London did a few years ago, like we’re on the verge of something. It’s like it was when I was back at the Jolly Butchers, before the Euston Tap opened and before there was really any London beer scene. Back then it felt like we were on the verge of something big and now it feels like this in Manchester, which is great and I want to keep chasing that!" "I think IndyMan is probably the event of the Manchester beer calendar. It’s just a great vibe, great people and good beer. The thing that excites me about the Manchester beer scene right now is just the diversity. Here you can get micros that are making bitters, porters or milds and then there are people like us at Quantum making, well, whatever the hell happens! It’s a great mix of everything." "How as IndyMan changed over the last four years? Wow that’s a question. I think it’s become more British beer focused and a lot more local beer focused. This year there are a lot more Manchester based breweries. Although it’s grown every year it hasn’t lost the heart that it has, in fact it seems to be even more inclusive and I think it’s a really important part of why British beer has grown over the last few years. It’s a great example of how things have progressed in the UK." "Honestly, IndyMan has always been great but it’s always been kinda the same. The first year that IndyMan happened I went and was like “Woah this is great!” Yeah, the first year blew my mind but last year I went and I had a bunch of really underwhelming beers from upstart, ambitious craft breweries who don’t know what they’re doing. I think the best beer I had all night last year was Magic Rock High Wire because it was pretty cheap and I only had one and a half tokens left. I said to myself: “why have I spent all day drinking this barrel aged nonsense that isn’t very good.” In that sense IndyMan’s always been great but it hasn’t really evolved a lot." "I think the Manchester beer scene is about where London was maybe three or four years ago, so coming to IndyMan is kind of like experiencing that all over again. There’s this amazing explosion of new breweries and there’s nowhere else quite like it at the moment – I just hope it comes to Birmingham next!" "The thing that makes IndyMan so special to me is just being in Manchester. There are so many wonderful people up here and they all love great beer. My highlight at the festival has actually been Bundobust, the Indian street food vendor in Leeds who are just about to open in Manchester, I love it." Craig: "I think IndyMan has changed a lot over the last four years, it’s certainly got busier – oh and there’s better bar snacks here now. There’s a wider range of breweries, more events going on, everything changes with each year. They’re always tidying it up, the organisers really know what they’re doing." Penelope: "This is our second year at IndyMan making snacks but it’s our fourth year here. The festival has grown every year and it’s grown in a good way I think. Each year they’ve used more of the building, there’s more interesting things going on and as Craig says they’re tightening it up each year. It’s not getting more confined or becoming strict, it’s growing in a good way: it’s getting bigger and more exciting." "I think realistically IndyMan could’ve been in any city but because it was in Manchester I was here from the very beginning. In fact I was at the very first IndyMan session, so I witnessed the first inception of what everyone considers to be the start of a change in the British beer festival scene. I was one of the first through that door when it was only in two rooms and as such I was one of the first to go “wow, this is different, this is what it could be.” And so I was one of the first to realise that this had changed everything. It could’ve been in any city but because I’m a Mancunian and it happened in Manchester, I was here first." "This is my first experience of this beer festival but they showcase the absolute best of British beer and you don’t really get that at a lot of the other beer festivals. Other festivals showcase regional or local breweries but IndyMan tries to get every brewery competing to be the best under one roof. It’s a pleasure to be involved with all these other breweries and have so many educated beer drinkers in one building." "To me, IndyMan is a unique event that’s setting its own agenda but not part of the mainstream. The mainstream of course is drinking beer in pubs as it has always been. Additionally: beer festivals where you could actually drink a few pints. IndyManBeerCon has got a great role to play in introducing people to beer but not necessarily introducing people to 'drinking' beer." "I’m based in New York City and this is my first impression of Manchester. The sour beer trend that is happening over here is great. It’s something that’s also happening concurrently in the United States so its awesome to see that also happening in the UK. I spent some time in the UK, working & studying in Scotland and I was watching the beer revolution happening here but at a slower pace than in the US, in my mind at least. So now I’m really seeing it catching up with the pace and innovation of US breweries and that’s absolutely fantastic." "This is my first time at IndyMan and I’m really excited, I’ve heard so many good things. The thing about IndyMan that excites me, other than the amazing breweries that are here, is the atmosphere. Oh, and so much great beer." Dan: "I was here for the first IMBC with the guys from Summer Wine brewery. It’s an amazing venue, really well organised and a very unique beer event in itself because of the location. I’ve had a beer here for every festival over the four years so that’s why I’m here really. This year I’ve brought a Mexican double mild with London Brewing Company and a barrel aged peated wee heavy I brewed with Northern Monk." Rick: "I’ve never been to IndyMan before so I can’t really compare it to any others yet, but the food seems to be overpriced in comparison to the beer. Still, it’s a nice chilled beer event with good people and it’s not up its own arse." "This is my second time at IndyMan, I came last year and I’ve been looking forward to it since. I’ve come back to IndyMan because its one of the places where you can get the oddest beers. Normally when you go to a beer festival you can get some great stuff and some unusual beers but at IndyMan you can get genuinely freakish things: the kind of stuff you’ll usually only find at an obscure little beer shop. Here you can wonder around, trying it and discussing it with like-minded people – it’s a really good social event." "I suppose IndyMan is the seminal beer festival that best represents what’s going on in the modern UK beer movement. It’s widely regarded as the most progressive beer festival – the way it curates the brewers that are here and the beers that are served is just impeccable. The venue’s absolutely stunning and the food is always good. I think, having been to quite a few beer festivals now, that there are many that can take away a lot and learn a lot by coming to IndyMan." 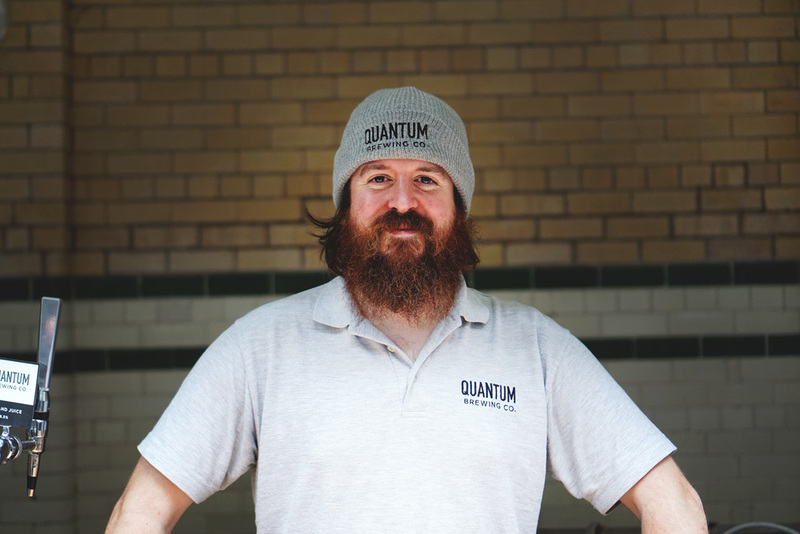 "For me, on a personal level, Manchester was where I cut my chops as a brewer. My real first break came when I took a job at Marble here in Manchester and I got interested in the beer scene proper through that. I think the great thing about the Manchester brewing scene is the desire to try new things. There are 70 plus breweries in Manchester alone and it's crazy to see how many are popping up and how many people want to try different styles. I blame Port Street Beer House personally, they started all of this." "The atmosphere at IndyMan is incredible, the venue is the best venue you could ever imagine for a beer festival. The beer is incredible, the food is incredible, the whole curation... can we use curation? Yes, the curation of the entire event is amazing. Everything is in line with what you’d want out of this kind of event. I don’t want to go home." "The thing that makes IndyManBeerCon so special is just the sheer amount of beer that they have on, the quality of the beer and the setting that it’s in. Also it’s so well organised, it’s a phenomenal event, the kind of which I’ve never really experienced before. It’s a very one-of-a-kind event." "The thing that makes IndyMan so special to me, and I think everyone’s going to say the same thing here, is the location. It has to be this place. It’s fantastic to walk around the Victoria Baths, to get lost, to meet people, to discover the different parts of the building. It’s also great when you’ve been coming here since it began four years ago to catch up with old friends." "IndyMan is special because of a combination of the location, the venue and the wide range of breweries. I like the way the beer is served as well: everything is a third and it just makes the pricing easier, especially behind the bar." "I’ve actually been packed for IndyMan for about two weeks, I’ve been so excited. I brought an entire suitcase full of snacks. IMBC is better than my birthday, this is where I get to see all of my friends. I used to go raving quite a bit and this is the beer version of a rave. It’s about getting to see all the friends you want to see, to party together and to drink all the best beer in the world."